Greater emphasis on historical accuracy and the role of political systems, naval forces and religion in the Medieval era. A new outpost building that can train scouts and mercenaries - mercenaries are costly and weak, but can be summoned to break rushes. More realism! English longbows can no longer outshoot or out-power arbalests, but can deal splash damage against opponents! The Noble's Court, a powerful defensive building that can perform special upgrades and train elite warriors. Regional units are units that are like unique units but are shared by multiple nations such as the Muslim Ghazis, Asian conscripts, Germanic feudal retinue and the Scandinavian longships. 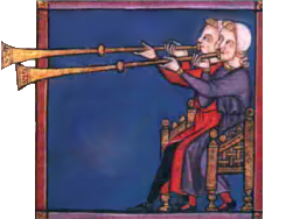 The castle can train gunpowder units like arquebusiers and bombards: gunpowder units hit harder but less further than their wooden counterparts, and are also created faster. Technology's importance is increased. In the past players often neglected research. Now, with various technologies and upgrades feeding into one another, research has an even more vital role to play. Some naval units can only be built if a nation researches a certain government type. New wonders like the Tower of London and Chartes Cathedral. Also we are introducing a system that makes sure nations only have access to wonders that suit their region but still gives all nations access to an equal number of wonders. Many new textures and models for units and buildings across the mod. Plenty of new units too, from English knights-sergeants to Hussite War Wagons to the mighty Venetian Galleass! Over twenty newly retooled factions, representing the powers of the Medieval Old World: join the quest of the Holy Roman Empire for supremacy, defend your home with the erstwhile Armenians, or conquer the world with the Mongols. One of the problems with adding mercenaries to Rise of Kings was that due to how Rise of Nations is constructed, it's not easy having mercenaries shared over various different factions. In fact, some would say that the mercenaries of Rise of Kings are its main selling point. Moreover, it also felt ahistorical that as factions progressed socially and militarily, they would still be stuck using units which were woefully underpowered. 3. If a mercenary unit has a common weapon type that correlates to a Centralisation-based unit, they will be converted to the new unit once you have researched Centralisation at the Nobles' Court. The upshot of obsolensce by Centralisation is that if you still have any survivng mercenaries, they will receive the new training and provide you a one-shot group of modern infantry for use. This is useful especially for Venice, since Venice requires infantry to support its mercenary Stradiot cavalry. Previously there was an issue with custom units where they would suffer from a darkening bug whenever they were made to turn about. We finally figured out what this issue was, and would be fixing it shortly. At the same time, experiments with Age of Darkness have also yielded up secrets regarding how warships operate and how they are to function. We will also be fixing the animations for warships, which is something that many of you have frequently complained about previously. Rise of Chivalry is currently still in WIP as we are studying the feasibility of scripted events. 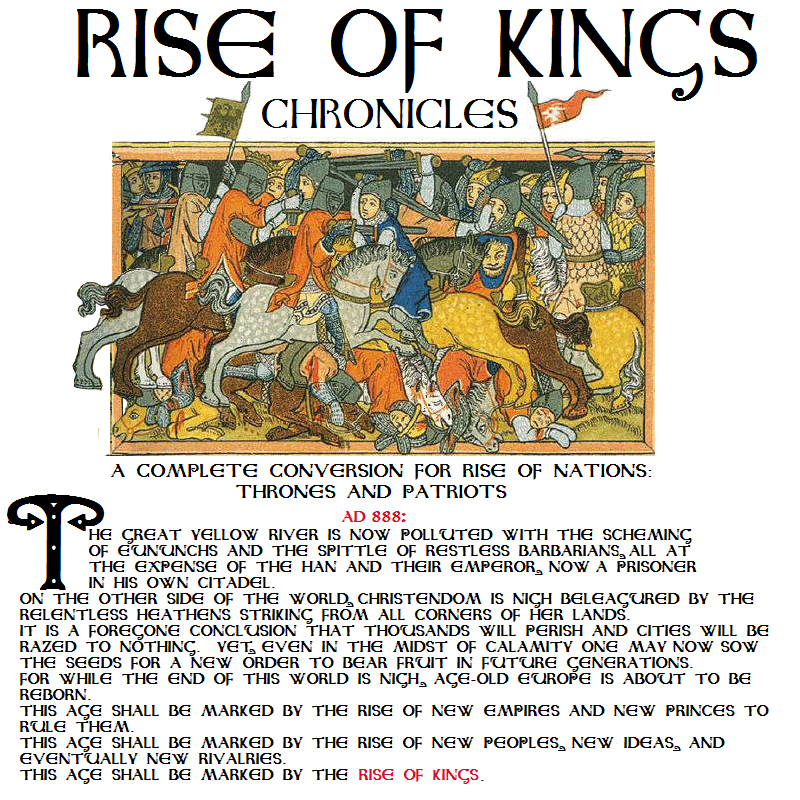 For more updates, visit Rise of Kings Wiki and check the "Campaigns" tab at the top of the page. New infantry sprites, a couple of new units and an all-new mechanic utilising politics. List of new nations and who they replace, list of new buildings, wonders and some other features. Older version of the mod, download Rise of Kings 1.1! Be careful though as there are still quite a lot of issues especially with icons as well as unit spawns not working as they should. Started checking out Steam. Unfortunately, it's as mentioned by one of the people here, directly using the mod folder as in Gold version will result in deformed icons. The only thing we can do right now is to continue compiling everything first before exporting to Steam. As part of this mod's first appearance on Steam, we are going to be adding more units for various factions, including Portugal, Turkey, Poland and China. Stay tuned. A question for other posters: what do you think about Sicily? does it need improving? would you be happy if Sicily had access to the Beitul Hikmeh like all the other Muslim factions? Where can I download the latest version.. and what is the latest version? 1.1? 1.2 has apparently been deleted and I don't understand why both the original mod and the newer chronicles version are both listed as being recently updated? Look for it under the "Features" section of Rise of Kings: Chronicles on Moddb, but note that the DropBox version for download is KOed. I am porting the wiki from Wikia due to copyright issues. A special announcement will be made soon. After much reworking and rethinking, I have finally discovered why the Rise of Kings script is NOT working and I can happily say that I am compiling a new script that ACTUALLY does what it is supposed to do! Asi se habla <3 , puedes terminar la mod era helistica? , a la gente le encantaria revivir las batallas de los macedonios, espartanos , romanos y los poderosos barbaros. Seria bueno que lo completaras o hicieras un nuevo mod referido a lo que te digo. Okay, no tengo lido todode tu post — y lo siento yo — mais lo que puedo dicer, en este momento, que el principario Super7700 es indispuesto, y no puede volver para que se completa Kings & Conquerors. Ya existe una mod para ese: moddb.com/mods/kings-and-conquerors mais la mod no es completa como esa.